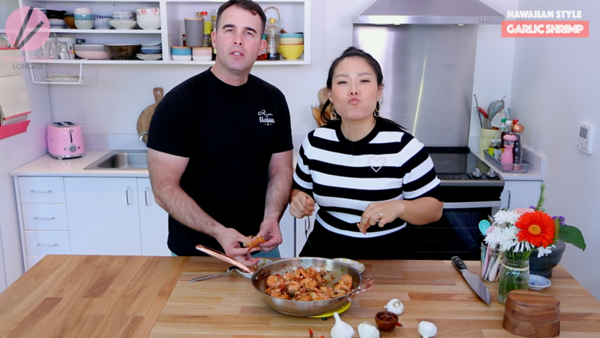 Let’s get into the Garlic Shrimp recipe I’m about to share- that I had in Hawaii!! Traveling to Hawaii was definitely a lovely memory that I will be chasing for my life time. And while I was in Hawaii, we had SO MUCH FOOD, as usual. Poke, garlic shrimp, udon, poke, garlic shrimp, udon… Seriously, I will never get tired of their fresh yet hearty flavors.. LOVED it!! Garlic shrimp is definitely my new go-to menu now for dinner or small gathering, because it’s very easy and quick to make without no prep time!! YAY! 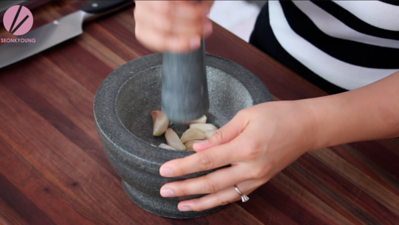 What I like to do for my garlic shrimp is pound whole bulb of garlic in a pestle and mortar. 1 bulb of garlic is about 10 to 13 garlic cloves. You can chop it also, if you prefer. 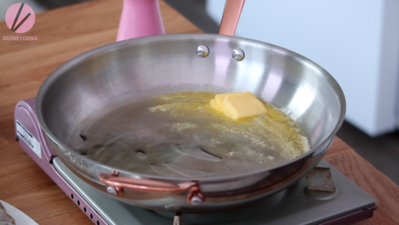 Heat a large skillet over low heat and add butter and oil. Let butter melt completely then add pounded garlic. 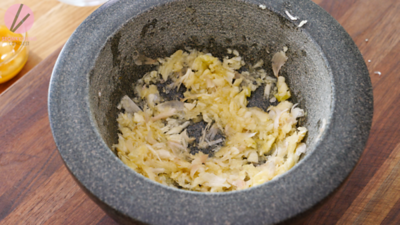 Cook the garlic low and slow, until the garlic is golden brown crispy about 4 to 6 minutes. Meanwhile, mix fish sauce, soy sauce and palm sugar in a mixing bowl and set aside. 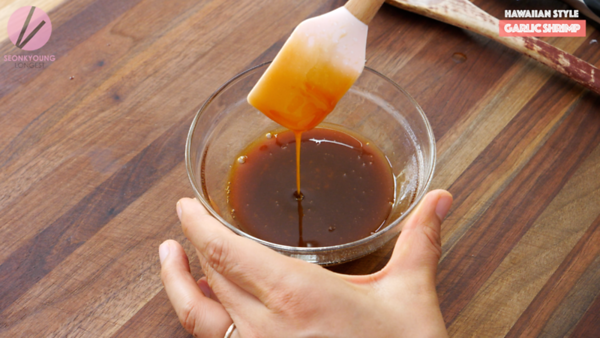 You could use honey or maple syrup instead of palm sugar! 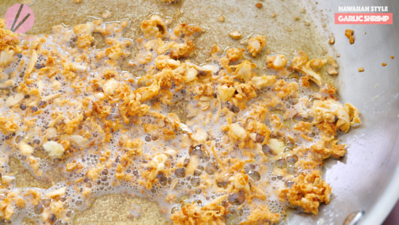 Remove the crispy garlic and place on a paper towel lined plate and set aside. 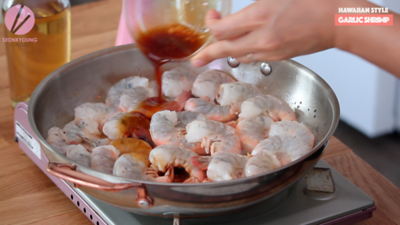 Increase heat to high the now-empty pan, add shrimp and pour the sauce. I used jumbo size shrimp from Costco, head off and deveined. Stir fry the shrimp with the sauce until shrimp is fully cooked, about 2 to 3 minutes. Sprinkle in the green onion, chili and 3/4 of crispy garlic. Sprinkle remaining crispy garlic right on top as garnish. Serve with lemon wedges or squeeze right on top right before serve! Today’s post is sponsored by Mevo, the leading live stream camera! I do live weekly on Facebook, every Wednesday night and it is one of the things that I’m looking forward to through out the weekend! It is so fun, I love the raw connection and conversation with you guys while cooking up some delicious food! Mevo is a game changer for live streaming because it let us do live like the real pros in the TV control room! I was so happy that when they said they will provide $50 coupon for you guys!! 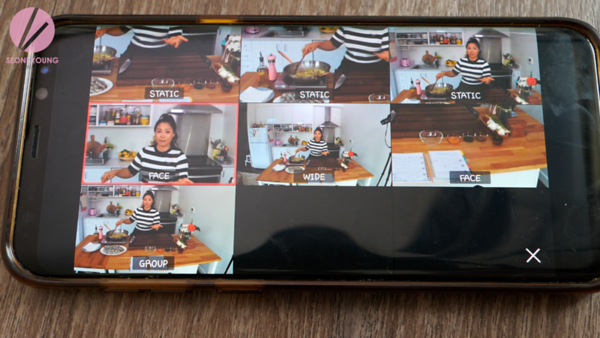 If you ever though wanna be a food blogger or YouTuber like me, as an 8 year experienced YouTuber, I can highly recommend Mevo because lie streaming is the future contents. Mix all the ingredients for the sauce in a mixing bowl and set aside. Heat a large skillet over low heat and add butter and oil. Let butter melt completely then add pounded garlic. Cook the garlic low and slow, until the garlic is golden brown crispy about 4 to 6 minutes. 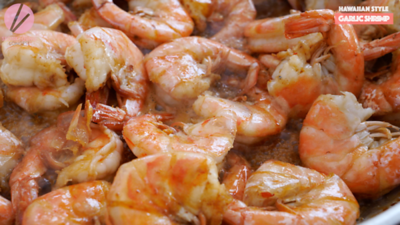 Increase heat to high the now-empty pan, add the shrimp and pour the sauce. Stir fry the shrimp with the sauce until shrimp is fully cooked, about 2 to 3 minutes. Sprinkle in the green onion, chili and ¾ of crispy garlic. 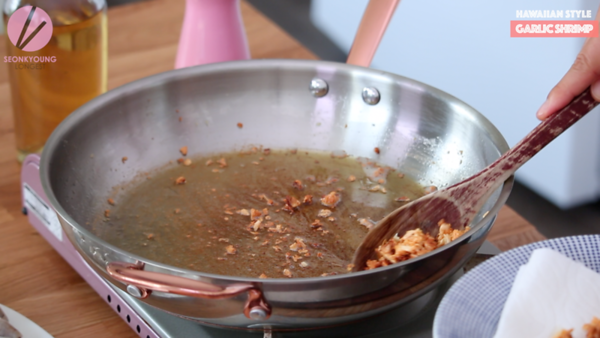 Sprinkle remaining crispy garlic right on top as garnish. Serve with lemon wedges or squeeze right on top right before serve! Could I use precooked shrimp for this? Also…I’m a huge fan!!! I love you!!! I won’t recommend precooked shrimp, the texture might end up tough. 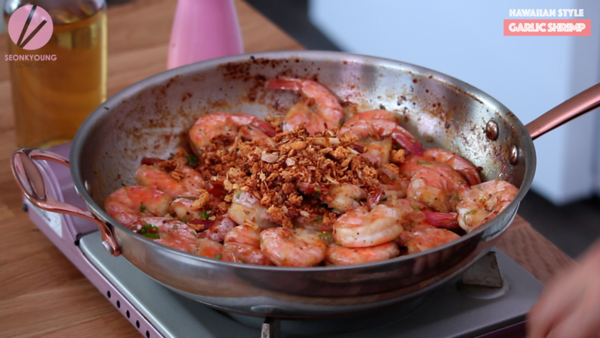 Maybe do all the steps without adding shrimp in the pan and just toss the cooked sauce in precooked shrimp? Hope this help!